images"The power of art substantiates its value in society. The premise that thoughts and emotions transcribed into visual images can affect behavior, fascinates me. The slightest suggestive response gleaned from a painting can trigger narratives of historical and contemporary events or generate feelings of pure visual excitement, social consciousness, movement and ecstasy. This points to the purpose of art&mdash;its enormous inherent power to influence an individual, or entire civilizations. Unspoken communication is a key to enlightenment and peace, and this is the thrust of my commitment as an artist. "Lancaster County artist, Claire Giblin, was born and educated in New York City. She studied fine art under the tutelage of professional artist and historian, Vincent Mercaldo, attended F.I.T., Lebanon Valley College and Franklin & Marshall College. 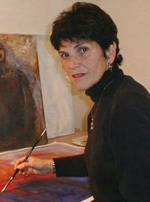 Giblin is the recipient of national and regional awards in art, including the 2002 Grumbacher Gold Medallion, and the 2000 National Grand Prize Winner of NAOFA. Giblin was honored as 2003 "Woman of the Year" by the Women's Center at Franklin & Marshall College. She has curated exhibitions, led workshops, participated in government funded exhibitions, solo shows, joint, invitational, national and international juried exhibits, museum and gallery exhibitions in the US, Spain, Italy, Japan and Korea, and has served as juror and panelist for art organizations and the Pennsylvania Council of the Arts. Her work is in national and international corporate, museum and private collections, and is registered with the International Registry of Artists and Artwork. Claire is co-owner and Director of Pfenninger Gallery in Lancaster City.